Legend has it that around 1590 Galileo Galilei dropped cannon balls and other munition from the tower of Pisa and thus discovered the law of ‘free fall’: The fall velocity of an object in a vacuum is independant of its form and mass. Due to air resistance, the fall velocity of an object in the Earth’s atmosphere is slowed down in accordance with its form and mass. According to another incident which was also described as a legend by many sceptics, in 1971 during the Apollo-15 Mission the Astronaut Dave Randolph Scott simultaneously dropped a hammer and a falcon feather in front of a video camera to prove the event actually took place on the Moon and not on Earth. Due to the bad quality of the video recording it was difficult to recognise which object Dave R. Scott had actually dropped. However, the NASA photos of this world famous ‘experiment’ showing the hammer and the feather lying post factum in the dust, should have eliminated any doubt. During a visit to the USA, the artist Agnes Meyer- Brandis traveled to Cinder Lakes Crater fields in the state of Arizona. At the beginning of the 1970s, shortly before the Moon landing, the future Apollo-15 team trained in this lunar-like environment. On the edge of the crater, the artist recreated the renowned experiment and also let a hammer and a feather simultaneously fall. Both objects landed at the same time. This confirmed a long-suspected theory of hers about the gravity anomalies of this site and inspired her to search for more gravity anomalies in the vastness of the american deserts and cities. The journey of discovery led Agnes Meyer-Brandis to wondrous places and to encounter commendable people. Applying her own methods such as the homemade gravity meter and other instruments for the detection of gravitational variations, the artist investigated the crater and discovered anomalies that allow rocks to float freely through the air. She stood aslope in the Death Valley and in the White Mountains, in front of the oldest trees on earth—Bristelcone Pines that are almost fi ve thousand years old—and the telescopes at the radio observatory in Owens Valley. The angle of her body to the earth’s surface became the most important indicator of the sought after gravitional variations. In the Californian Mojave desert, in the region of the Lucerne Dry Lake, she discovered a small Cosmodrome—a Rocket Test Facility—run by an organisation the Friends of Amateur Rocketry, where hobby rocket builders as well as professional developers of space technology are committed to testing their latest creations and launching them into space. In the Department of Earth and Space Sciences at the University of California, Los Angeles, Agnes Meyer- Brandis discovered a collection of Moon and Mars samples, and even solar wind samples, which were brought back to Earth by various spacecrafts and which are now being examined and stored following strict scientific procedures by specialists at the University. The traces of gravitational anomalies led the artist further to Nor	th Hollywood to the shop Norton Sales Inc., a second-hand shop for the space industry, where space junk, test equipment and remainders from various manufacturers who once competed for NASA orders, can be bought by interested parties for a variety of purposes—for use on filmsets or by amateur rocket builders. It is these diverse elements from our layered histories that Agnes Meyer-Brandis brings together to form new, surprising perspectives in her works the series Of Rocks and Rockets. These kinds of ‘scientific experiments’ and selfmade ‘research tools’ have long since become a key characteristic of Agnes Meyer-Brandis’ artistic style and approach. With the first protoype of her Coral Reef Detector in 2002, the artist located subterranean coral reefs in the fields of Poll, Cologne, and then tracked the life of their mysterious inhabitants. In her work Earth Core Laboratory and Elf Scan (2003) Agnes Meyer- Brandis studied the subterranean depth layers with the assistance of a homemade core-sample scanner in her search for elves and other subterranean life forms. In 2005 she developed the SGM Iceberg-Probe (SGM: SubGlacialis Montometer), “an explorative high-precision apparatus for the investigation of subterranean icebergs located under ice-skating rinks”, which gives an insight into life’s peripiteia, and in this case, those of subglacial fields. For these investigations, Agnes Meyer-Brandis founded ffUR || Research Raft for Subterraenean Reefology. ffUR’s research scope has broadened over time and now spans from the depths of the earth to the expanse of space, currently focusing on the mysteries of all known elements of the natural world. 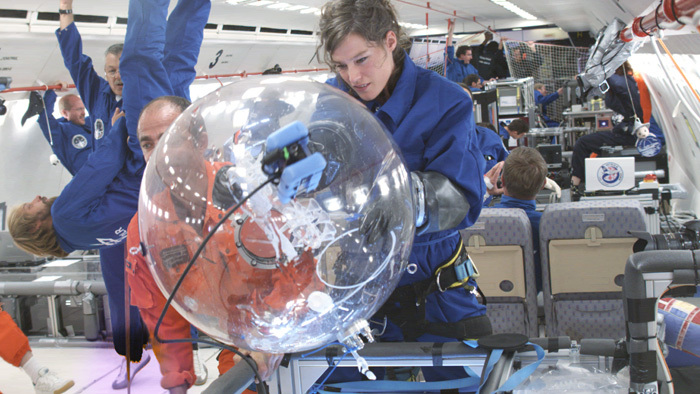 The physical, highly complex processes of the formation of clouds and cloud cores (aerosols) were investigated by the ffUR-founder in 2007 by taking part in the parabolic flights of the German Aerospace Center (DLR). During these flights, the artist further tested the research tools she had developed—Cloud Core Scanner CCS and ADM-Filmbox, which assisted in observing the formation and fascinating life of cloud cores at zero gravity. 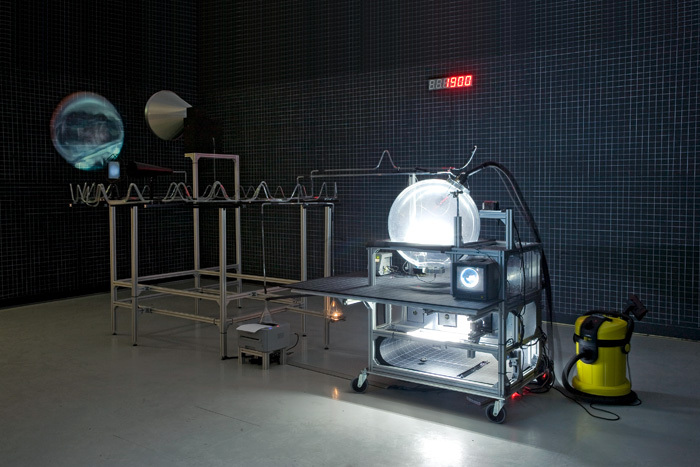 The results and findings of this artistic cloud core research was developed further by Agnes Meyer-Brandis in her project Inside the Tropospheric Laboratory (2010), where she constructed a complex apparatus to produce aerosol and to illustrate its transformation. Both metaphoric-conceptual and physical-material connections between space and earth are expressly found in the artist’s Meteor Research projects. Based on her research and the happening Impact – Public Meteor Watching, in May 2009 in Ekaterinburg (Russia) the sculpture The Golden Crater was created at the front of the National Center for Contemporary Art (NCCA). In November 2010 she organized a Public Meteor Watching in a small town Sint-Lievens Esse, Belgium. By applying the most current methods of artistic meteorite research, the artist was able to forecast the precise location and specifications of the meteorite landing. The subtle humor and the (self)irony of these works, both in their content and execution, are nevertheless unmistakeable. This tempered approach safeguards the research raft production from simply becoming a selfsufficient parody of current scientific research methods and techniques. In the current climate of cultural policy inspired Art as Research, the use of humour and irony is above all an indication of the critical, highly considered position of the artist. In contrast to the proliferation of artists who unconsciously adopt the role of hobby-scientist and produce a kind of esthetically-uninspiring, educational and illustrative Science Brut ,—Meyer-Brandis’ makes her artistic competence the departure point for her work and places the formal-esthetic aspects of the presentation of her ‘investigations and experiments’ in the foreground. This attitude aligns more closely with the good old traditions of modernist artistic autonomy than the common esthetic abandon found in most science-art projects of recent years. Similar to the earlier works of Meyer-Brandis, the Of Rocks and Rockets series is a rare example of an approach which can literally be described as artistic research and which in fact provides many new findings. Her photographic and video observations, such as those of the University premises and of the planet samples stored there, or of the shop for space junk, potentially tells us more about the organizational stuctures and functioning principles of the Earth and Space Sciences or the expansive space industry, than the dozens of dissertations in today’s trendy subject Science and Technologies Studies (STS). In the 1970s, the French sociologist Bruno Latour carried out his first observations of the routine work processes in labs and research centers, and based on his ’field work’ results wrote the now internationally-acclaimed academic bestseller Laboratory Life and Science in Action. Today the artist Agnes Meyer-Brandis enters similar laboratories and research centers with her photo and video cameras and conducts extensive interviews with scientists, in order to essentially carry out her own investigations. Behind her actions, however, we can see what takes place inside these laboratories and centres, and how they actually function. The artist’s images, videos and performances not only function as poetic audiovisual expressions, but also as esthetic (in the sense of ‘sensory knowledge’, as originally defined by Alexander Baumgarten—the founder of esthetics as a philsophical discipline), contextual extensions and complements to explorations conducted in Science and Technology Studies. The fictional character of some research themes and instruments in Agnes Meyer-Brandis’ artistic research projects presents an additional counterpoint to the authenticity of the environments and the protagonists portrayed in them. In these works the artistic fiction, similar to the ones we know from Duchamp, Broodhaers or Kabakov, proves once again to be the most powerful weapon in the struggle for the truth. the German Aerospace Center DLR. Supported by the Filmstiftung NRW. production of DOCK e.V. in collaboration with the Schering Foundation. 1 For more on the term ’Science-Brut’ see: Lioudmila Voropai, ‘Media Art and its Theories’ from ‘New Avant-garde’ to ‘Science-Brut’ // ISEA2010 Ruhr: Conference Proceedings, Revolver Verlag Berlin 2010. p. 90–91. 2 Cf. Bruno Latour, Laboratory Life. The Social Construction of Scientifi c Facts, Beverly Hills 1979; ibid., Science in Action. How to Follow Scientists and Engineers through Society, Milton Keynes 1987.